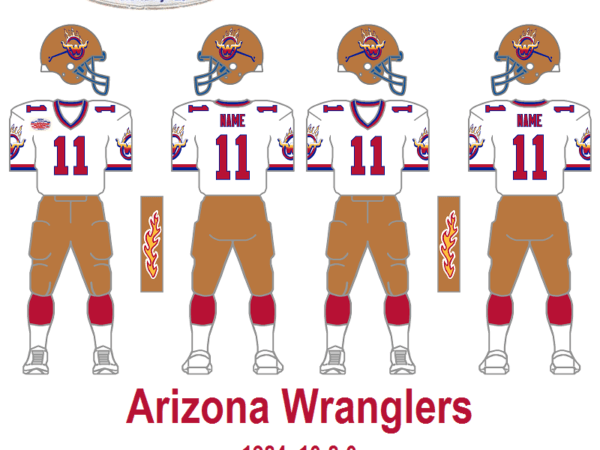 The team that would eventually become the Arizona Wranglers was originally supposed to be the USFL’s Los Angeles franchise. The team’s planned original owner, Alex Spanos, pulled out of his USFL commitment and instead bought a minority stake in the NFL’s San Diego Chargers. The owners of the Oakland Invaders, Bay Area real estate executives Jim Joseph and Tad Taube, flipped a coin to decide who would take action to become the new owner of the USFL’s Los Angeles franchise. Joseph won the flip and got the USFL rights to Los Angeles, while Taube retained full ownership of the Invaders. USFL officials felt that Daniels and Harmon’s ties to the cable industry would be better suited for the country’s second-largest market. The league forced Joseph to surrender rights to Los Angeles to Daniels and Harmon, whose franchise became the Los Angeles Express. Joseph finally settled on a move to Phoenix, bringing professional football to that Arizona city for the first time. Joseph lost millions of dollars in the 1983 season. Like most of the other owners, he’d bought into the league knowing to expect years of losses. However, he was disappointed in the team’s attendance and unwilling to stick it out in Arizona. In a stroke of luck for Joseph, Chicago Blitz owner Dr. Ted Diethrich (a Phoenix resident and founder of the Arizona Heart Institute) wanted a chance to move closer to his business interests in the Phoenix area. Despite fielding a team that had come up one game short of the USFL title game, the Blitz’ attendance had been lackluster at best. Diethrich had lost millions of dollars, and didn’t believe those losses justified an investment that far from home. Diethrich thought he had a solution to both his and Joseph’s problems—an unprecedented swap of franchises. Diethrich sold the Blitz to fellow surgeon James Hoffman, then bought the Wranglers from Joseph. Allen, who had been chairman and head coach of the Blitz, took the same posts in Arizona. Hoffman and Diethrich then engineered a swap of assets in which the Blitz coaching staff and most of the Blitz players moved to Phoenix while most of the Wranglers roster moved to Chicago. (The most notable exception was that Wrangler quarterback Alan Risher stayed in Arizona to back up former Blitz quarterback Greg Landry). The deal allowed Allen to keep virtually all of the NFL veteran-loaded Blitz roster that he had painstakingly assembled in 1983. The deal transformed the Wranglers from a cellar-dweller to a league powerhouse almost overnight. However, trading a team that had been, at worst, the third-best team in the league for a lesser version of one of the worst teams in the league raised questions about the USFL’s credibility—especially in Chicago. The Blitz would never recover, and would be effectively euthanized at the end of the season (Eddie Einhorn was awarded a replacement Chicago franchise, but it never played a down). 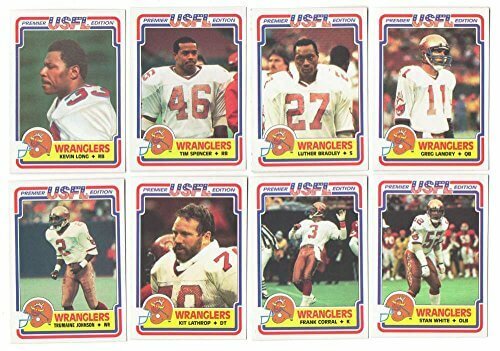 While the USFL was active, the league considered the 1983 and 1984 Wranglers to be the same franchise, even though almost all the players were different. Despite making it to the Championship game, Diethrich was bleeding in red ink. He expected his all-star team’s attendance to be much greater than the 25,776 fans per game the no-name Wranglers averaged in 1983. However, as had been the case a year earlier, Phoenix-area fans viewed the Wranglers mostly with indifference. Despite fielding a winning team, the Wranglers’ 1984 attendance figures (25,568 fans per game) were actually lower than the 1983 numbers, as fans were slow to warm to the new players. After losing millions for the second year in a row, Diethrich decided to get out. He found a willing buyer in Oklahoma Outlaws owner William Tatham, who was looking for a larger market with an acceptable stadium. The two men reached a deal in which Tatham acquired the Wranglers’ assets. Since Tatham acquired all the Wranglers’ player contracts, the deal was widely reported as a merger. Tatham relocated the Outlaws to Arizona for the 1985 season, merging the rosters into the Arizona Outlaws. 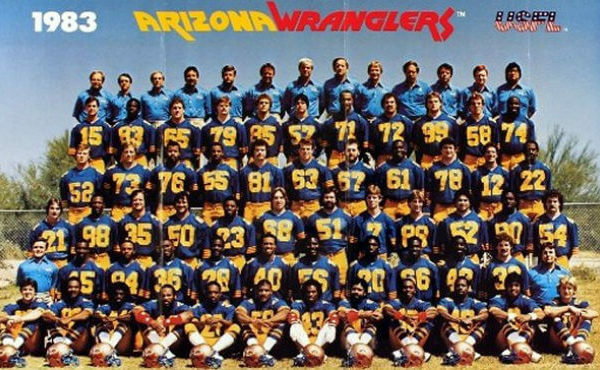 The Arizona Wranglers were a professional American football team that played in the United States Football League in the mid-1980s. A deal was made in which Tatham acquired the Wranglers’ assets. Since Tatham acquired all the Wranglers’ player contracts, the deal was widely reported as a merger. Tatham relocated the Outlaws to Arizona for the 1985 season, merging the rosters into the Arizona Outlaws. 1984 – 1986 / William R. Tatham Sr., William R. Tatham Jr.
Who is the greatest Arizona Wranglers?